William Henry Robertson (October 10, 1823 Bedford, Westchester County, New York – December 6, 1898 Katonah, Westchester Co., NY) was an American lawyer and politician from New York. He was the son of Henry Robertson (d. 1881). He received an academic education, studied law, and began practice in his native town. He was a Whig member of the New York State Assembly (Westchester Co., 1st D.) in 1849 and 1850; and of the New York State Senate (7th D.) in 1854 and 1855. He was Judge of the Westchester County Court from 1856 to 1866. He joined the Republican Party upon its organization in 1855, and was a presidential elector in 1860, voting for Abraham Lincoln and Hannibal Hamlin. 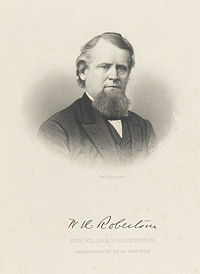 Robertson was elected as a Republican to the 40th United States Congress, holding office from March 4, 1867, to March 3, 1869. He was again a member of the State Senate from 1872 to 1881, sitting in the 95th, 96th, 97th, 98th, 99th, 100th, 101st, 102nd (all eight 9th D.), 103rd and 104th New York State Legislatures (both 12th D.). In 1874, after a constitutional amendment created it as a standing office, he was chosen President pro tempore of the New York State Senate. He remained on this post until his retirement from the Senate in May 1881 upon his federal appointment. In 1881, he was appointed Collector of the Port of New York by President James Garfield whose nomination he had helped to secure by leading a part of the New York delegation at the 1880 Republican National Convention to desert the Grant column. Robertson's nomination to the collectorship, made without consulting the wishes of the two Republican U.S. Senators, Roscoe Conkling and Thomas C. Platt, and, according to their claims, in violation of the President's pledge, led to the resignation of the two Senators and resulted in a serious party split. In the bitter struggle between the Stalwart and the Half-Breed factions which followed, Robertson was active in the campaign that resulted in the election of new Senators in the place of Conkling and Platt. Robertson was a delegate to the 1884 Republican National Convention, and held the collectorship until 1885. Afterwards, he resumed his law practice. He was again a member of the State Senate (12th D.) from 1888 to 1891, sitting in the 111th, 112th, 113th and 114th New York State Legislatures.